Today will be hot much but it is hands down the hottest day in the forecast for the next week. Without any thunderstorms to stop the temperature climb, today should top out in the middle nineties. Anything above 94° would make this the hottest day of the summer. We hit 94° three times last month. A Heat Advisory is in effect all afternoon and into the early evening. Look for the Heat Index to rise into the 103-108° range later today. A cool front is on the way! This features will knock our temperature and humidity way down for most all of next week. More showers and thunderstorms will lead the charge with this front late tonight. I expect storms to fire to our north and slip south into the Ozarks by late evening and into the overnight hours. 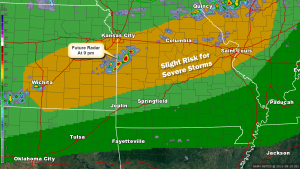 The storms which first start up may produce gusty winds and small hail north of Springfield affecting areas around Lake of the Ozarks, Hermitage and Stockton this evening. The cooler conditions start on Monday with the high temperature stopping around ninety. But the real cooler and drier air will kick in Tuesday and last through the rest of the week. Lows may drop into the lower sixties by Thursday morning while high temperatures stay in the eighties through Friday.